In this paper we address the usefulness of the notion of a paradigm in the context of derivational morphology. We first define a notion of paradigmatic system that extends conservatively the notion as it is used in inflection so as to be applicable to collections of structured families of derivationally-related words. We then build on this definition in an empirical quantitative study of derivational families of verbs in French. We apply information-theoretic measures of predictability initially designed by Ackerman et al. (2009) in the context of inflection. We conclude that key quantitative properties are common to inflectional and derivational paradigmatic systems, and hence that (partial) paradigms are an important ingredient of the study of derivation. 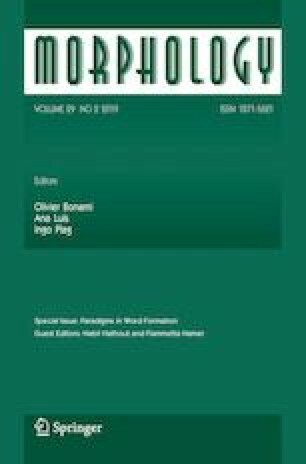 Aspects of this work were presented at the Workshop on Paradigms in Word Formation (Naples, September 2016), at the first ParadigMo conference (Toulouse, June 2017), and at Université Paris Diderot. We thank the audiences at these events, and in particular Laurie Bauer, Sacha Beniamine, Gilles Boyé, Nabil Hathout, Fiammetta Namer, Andrew Spencer, and Delphine Tribout, for their comments and suggestions. We also thank Farrell Ackerman and Anna M. Thornton, two anonymous reviewers, and the guest editors for this special issue for useful suggestions. This work was partially supported by a public grant overseen by the French National Research Agency (ANR) as part of the “Investissements d’Avenir” program (reference: ANR-10-LABX-0083). Cotterell, R., Vylomova, E., Khayrallah, H., Kirov, C., & Yarowsky, D. (2017). Paradigm completion for derivational morphology. arXiv:170809151.